For those prospectors out there who have dug up hardrock ore samples and want to test them for their gold content, there are a few different options that are available to you. But for many independent and smaller operations, you may realistically be limited on which type of testing you can use based on its overall costs. For most small-scale miners, you will be most interested in the free gold content within your ores. This is the gold that can be obtained without the use of more complex and highly regulated methods. Most lode mining in the U.S. is done by commercial mining companies on a large scale, primarily because of the high cost involved with startup and operation. This means that for companies will substantial resources, they have more options open to them than the smaller operators or individual miners. Mines that are expecting to process millions of pounds of ore can cost effectively consider more expensive extraction methods due to the huge amounts of material that they are processing. Probably the easiest way to test the gold values in your ore sample is to have an assay test performed by a local, independent assay firm. This is the simplest way to test your hard rock ore samples, but it is also one of the most expensive as well. Plus, the total gold content within your ore is only valuable to you if you have an extraction method that can collect it. Many ores contain gold that is locked up in sulfides, and cannot be recovered without significant expense that is out of reach for many miners. 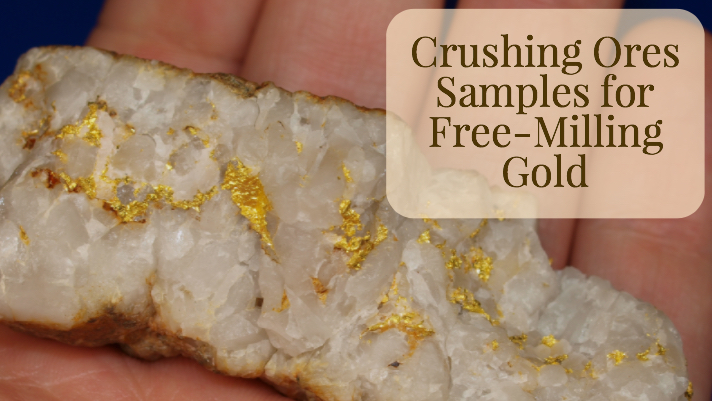 An alternative to an assay test is to determine just the free gold content found on the ore. Free gold is the portion that is easily removed without the use of complex chemical procedures. Miners have been extracting free gold from hard rock sources for thousands of years. It simply requires that the ore be crushed and broken apart enough that the gold can be separated from the host material. Arrastras and stamp mills were commonly used at mines all throughout the world for this purpose. On an even smaller scale, prospectors can crush up pieces of ore using a “dolly pot”, which is just a steel pipe that ore is placed in and crushed up. Reasonably priced rock crushers can also be bought that will make short work of any specimens that you want to break up. Once the ore has been broken up into fine dust, testing for free gold content in hardrock ore can be done using some type of gravity method. A simple gold pan can be used to sample small amounts of crushed ore, or if a decent water supply is available then it can be run through many types of separation devices. Shaker tables are commonly used, and although quite expensive, work exceedingly well for recovering small particles of free gold. The traditional chemical treatments done by large mining companies uses cyanide, which has a very significant permitting process that is unattainable for the average prospector here in the United States. For most miners, some type the gravity system is the best choice, as it does not involve any chemicals and does not require the same level of permitting (or none at all). Regulations have basically squeezed the smaller operators of hard rock mines out of the picture. Smelting plants that use to purchase considerable amounts of hard rock ore from prospectors have mostly gone away due to the high regulatory costs. While the high cost of extraction may limit the values that can be obtained from certain material, ores that have a considerable amount of free gold may still be mined profitably by the average miner. Once an ore has been crushed and the gold extracted, evaluations can be made on the overall value or potential for a mining operation. Mining for lode gold has a very high failure rate, mainly due to the extremely high operating costs that it takes to recover lode gold. Additionally, it is important to realize that a few small samples of ore may not be representative of a large area. Before undertaking any lode mining operation, a large amount of sampling should be done. There are many miners who have lost a lot of money by testing a few high grade pieces of ore and assumed that all the ore in the mine would be just as rich.